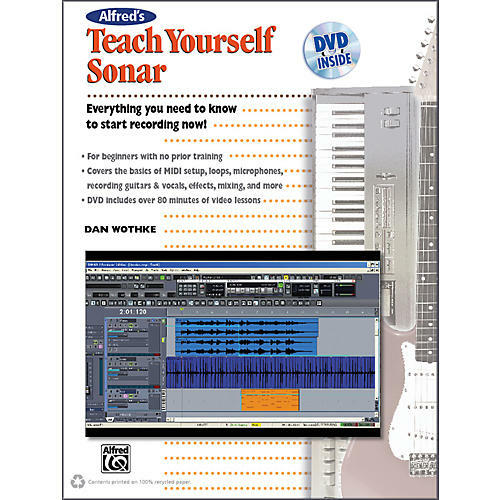 This book and DVD kit will teach you everything you need to know to get started using Sonar today! Whether you're a beginner with no prior training, or you have some knowledge of Sonar and are in need of a refresher course, Alfred's Teach Yourself Sonar is the perfect resource. You will learn how to optimize your PC; work with MIDI; choose an audio/MIDI interface; select microphones; use loops, software synths, and plugins; edit audio; and create a stunning final mix. When you're finished reading Teach Yourself Sonar, you'll be able to record, edit, mix and send your songs out for the world to hear on the web, on CD, and more. The DVD includes over 85 minutes of video and clearly demonstrates the essential features of Sonar with an easy-to-understand approach.